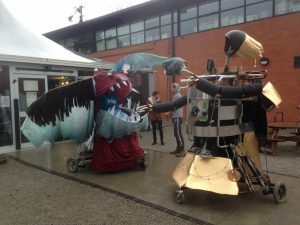 A 1day workshop run in partnership with Mike Pattison, a well established maker of mechanically inspired theatrical Creatures & Sets. After a brief introduction to ourselves and our work, participants are divided into teams and choose an envelope containing the command to either make a Monster or a Robot. What follows is an intensive creative and learning experience somewhere between Scrapheap Challenge and well crafted puppet making! Each team gets a briefing on a wheelchair motor driven Base designed and made by Mike and a starter frame kit in order to build off. Building materials are gathered from any interesting scrap and rubbish which can be laid claim to. Moving at lightning speed through design to structure and then decorative cladding we aim for short parade and then a dainty dance-off, which then given the tempory nature of the exercise often then leads to a friendly battle.